72055T-RB is rated 2.3 out of 5 by 38. Rated 1 out of 5 by AnnArbor from Does not work well - very frustrating each time I have this dispenser for over a year and feel really frustrated every single day. The hands-free sensor is facing front and gets activated all the time when using a sink. It should be located somewhere that there is no hand movement unless intended for its use. Then we have been using the tap function only, but the amount of soap is set. I sometimes need a little and other times a lot of soap depending on the needs. Why bother to use this dispenser if I can get soap much more easily with a manual pump dispenser. Rated 1 out of 5 by Honest from Don’t waste your money Hate it. Love the faucet touch but not soap dispenser. Horrible design, takes forever for soap to come out. 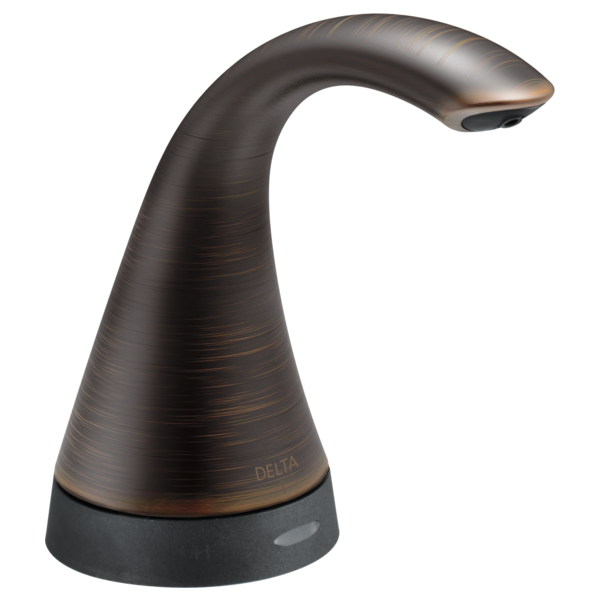 Rated 1 out of 5 by Jlove from DONT WASTE YOUR MONEY I chose this soap dispenser because of its sleek look, and it matched the Delta faucet we purchased. Within a couple of months, it was nothing but trouble! It was too easy to activate while working in the sink, dribbled soap after using, difficult to adjust soap quantity using touch technology, and the final straw was when the batteries kept falling out and wouldn’t stay securely housed in their flimsy case. It’s just an ornament now. We resorted to having a soap bottle sitting on the counter. Rated 1 out of 5 by Razntaz from Too much trouble Bought this several years ago and it works for about a week before it has to be reset. I agree with all other negative reviews except corrosion issues. Too much trouble to keep working. I am now shopping for a manual version. Rated 1 out of 5 by Pepper from 2 faucet in 12 months I purchased this faucet in Nov 2017, it stop working by March. I contacted Delta and they were quick to sent me the replacement. Unfortunately, the 2nd faucet only works for 2 months. I am very disappointed. Rated 1 out of 5 by Jerry from Very poor design I have this set to the highest out out of soap possible. It takes at least 12-20 taps to get enough soap for dishes. I thought having Delta would be okay. Guess not. Rated 5 out of 5 by Esther from Another great state of the art product by Delta! This soap dispenser not only looks great but it works great too! I use the "touch" feature instead of the "hands-free" option since I was constantly dispensing soap whenever I got near it whether I wanted soap or not. It's also convenient to disable by just grabbing the faucet and turning it to the right. The dispenser senses the difference between a "touch" to dispense and a "grab" to disable. Very nice!!! No fingerprints to worry about either in the black matte. Rated 1 out of 5 by MK71 from Not worth the $$$$ I purchased this in January and is stopped working in September. NOT the battery pack (which is a horrible design), the mechanism between the dispenser and the base is dead. What material is the dispenser made of? Is it plastic, or metal? I know the refill is above the deck but where is located to refill , what is the funnel for? Is this soap dispenser ideal for a banquet hall that can hold up to 1,200 people at one time? How can I program the amount of soap dispensed? Can the soap dispenser be hooked up to an electric power supply like the faucets?